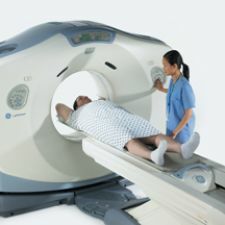 The GE LightSpeed RT is a third generation four-slice helical CT scanner with a gantry opening that is wider than those found on standard diagnostic CT systems. Because it has a wide aperture of 80cm, it allows flexibility in patient scanning positions, especially for those in radiotherapy treatment. It is suitable for use in the scanning of obese patients, trauma patients attached to life support equipment and interventional procedures where easy patient access is important. As well as having a larger gantry bore, the RT also allows images to be reconstructed with a larger field of view than a standard CT system, allowing images of up to 65cm to be generated using the RT’s extended field of view. These images can be used to visualise anatomy that lies beyond the scanner’s standard 50cm field of view. However, it should be noted that the portion of the image in the extended field of view will have a reduced image quality with respect to spatial resolution, noise and CT number accuracy, compared to that in the primary field of view.